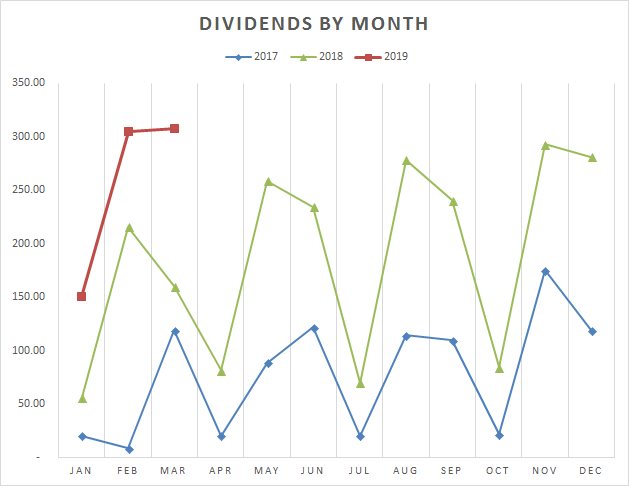 March was another record month for my portfolio in terms of collected dividends. I purchased shares of two companies this month, including one new position. By purchasing these shares, I added just under $100 annually to my future retirement income. 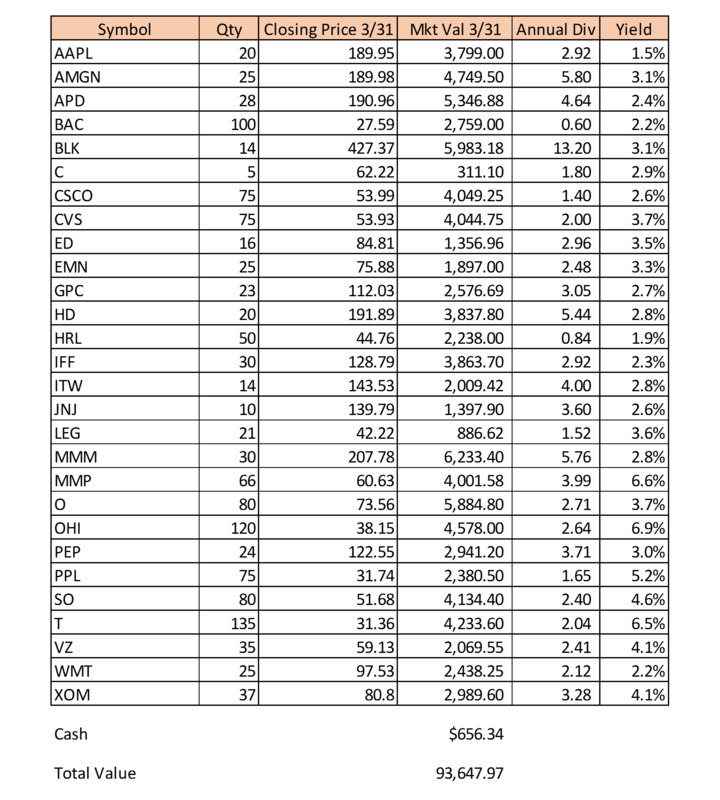 March was a record month for dividends for the Sand in Shoes portfolio just edging out last month. 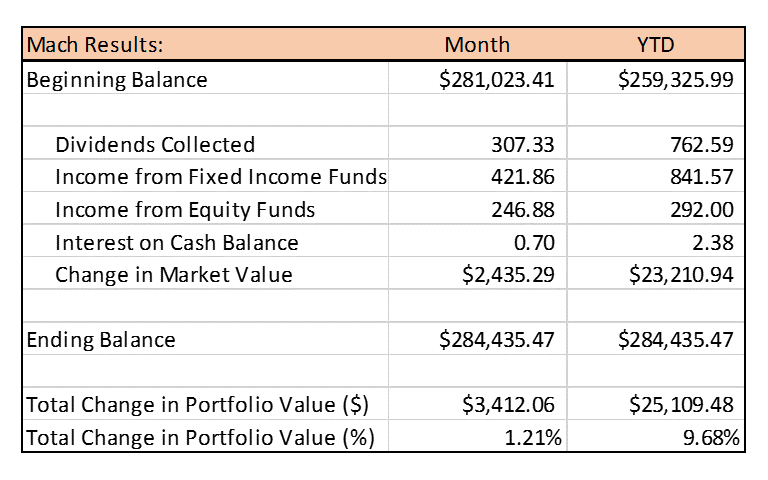 It was also the third month that the total portfolio value was up, so 2019 has been a great year so far. The YTD performance is up nearly 10% for the year already. And of course, since I purchased shares in a new position and added shares to another position, my projected dividends hit a new record as well. It has been quite a while since I last explained my goals for this portfolio, so I wanted to take a few paragraphs and do that. If you have been following me for some time, you might already know this and may want to skip ahead to the meat of the article. 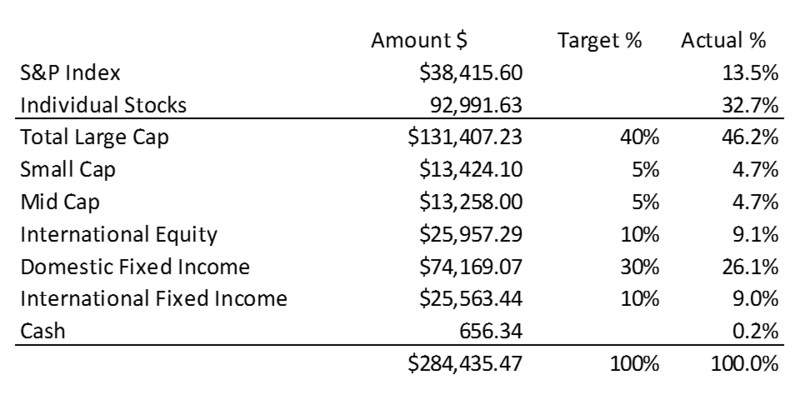 First, my big hairy goal relates to dividend income, and that is the reason I begin each monthly update with a report on the dividends I collected the prior month. 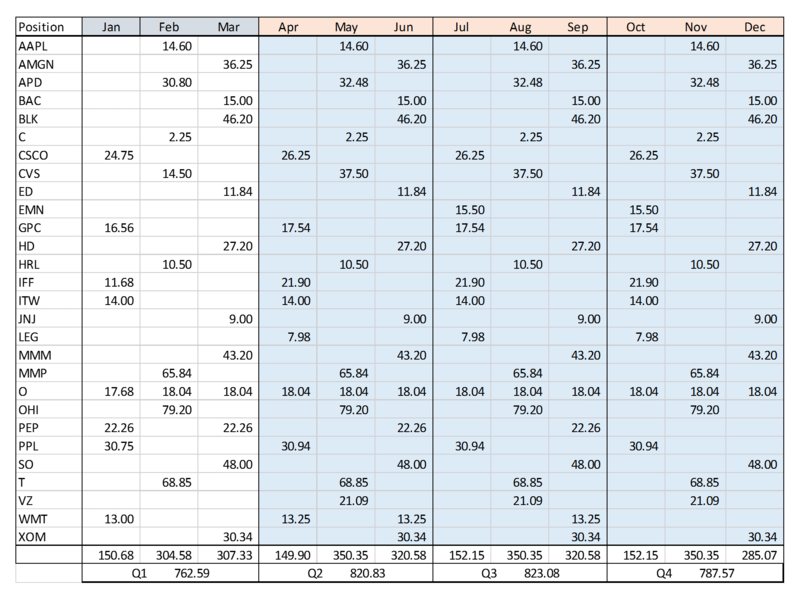 And recently, I added a new section where I project the dividends I will collect over the next 12 months given current information. 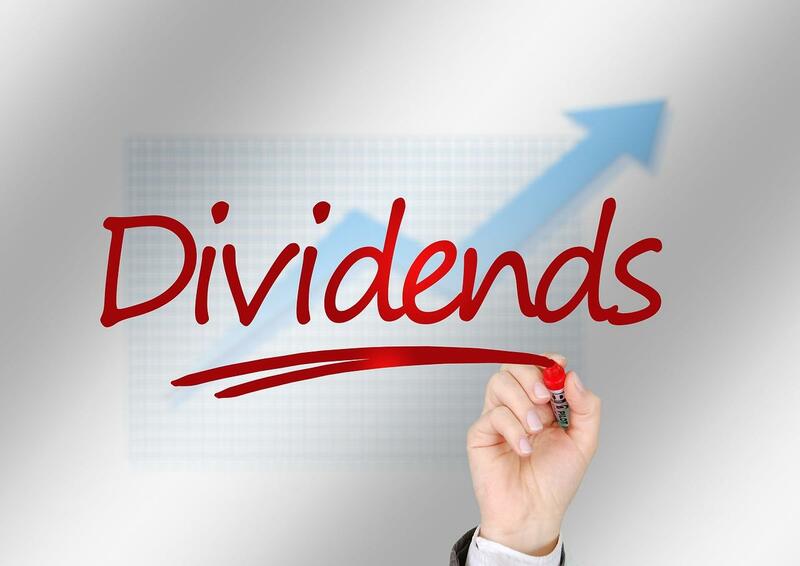 Dividends are very important to a dividend growth investor, which is what I call myself. The goal is $10,000 in annual dividend payments by the year 8/1/2026-7/31/2027. Currently, as you will see below, I am projecting $3,255.73 in dividends for the next twelve months. So we have a ways to go, and thankfully, I have eight years to get there. The second thing that is important to know is I am adding no new capital to this account. When I initially rolled the account over, I purchased about $67,500 of an S&P 500 index fund with the intent to slowly liquidate it and purchase stocks. I have been purchasing a few thousand dollars worth of stock nearly every month since I rolled over an old 401k. In order to do that, I have been using dividends collected, income received from my equity funds & ETFs, and I also sell about $1,200 worth of my S&P 500 ETF each month to purchase individual stocks. I have enough left in the S&P index fund to do this for about two more years. The hope is that by then I will be generating many hundreds of dollars of dividends per month as well as hundreds of dollars worth of distributions from my other ETFs and funds. In two years, that is how I will be adding to my positions each month. It just snowballs. Third, I am not DRIP-ing. 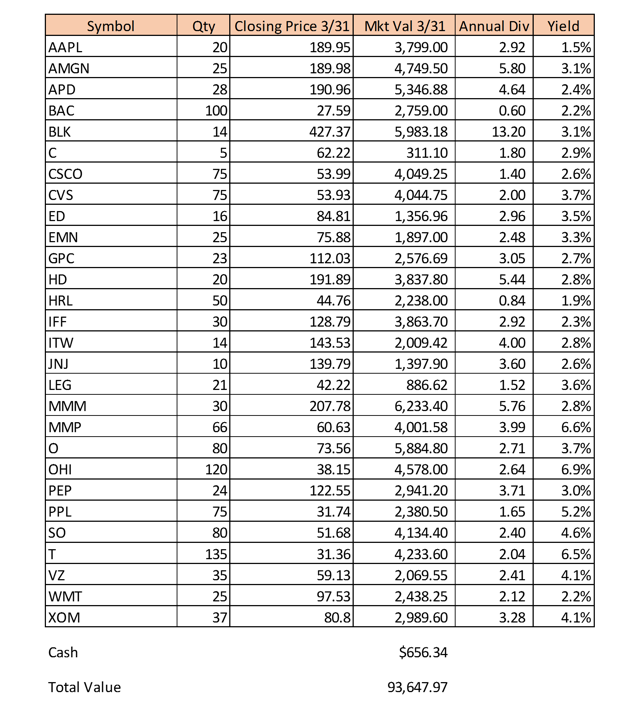 I received a bit over $300 in dividends in March, but I collected it in cash and did not automatically purchase fractional shares in the companies that paid me those dividends. That is, I received $36.25 from Amgen Inc. (AMGN) on March 8th but did not immediately purchase 0.2 shares, I simply added that $36.25 to my cash balance. That way I can choose which stock or stocks each month I find attractive and buy those with dividends. Fourth and finally, I will re-balance the portfolio from time to time, and right now it looks like that means moving lots of cash into fixed income. Which might actually be OK because I am having difficulty finding stocks that don't look kind of overvalued right now. With all that in mind, let's see where the portfolio stands today, and we'll start as usual with the dividends collected last month. 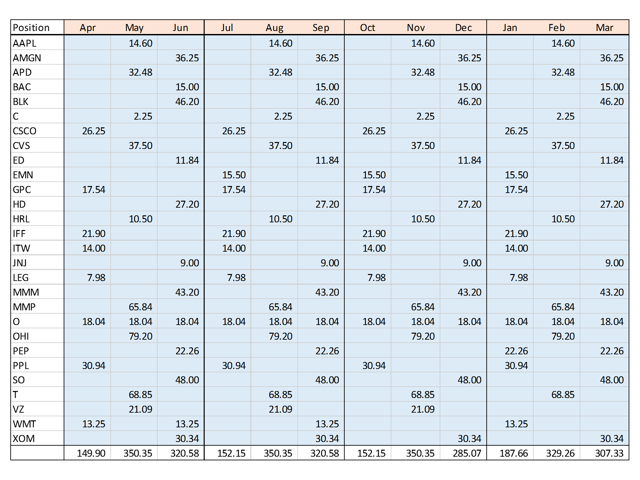 Last month was the first month where my dividends exceeded $300 in a single month and March just beat that total out. You may notice that PepsiCo Inc. (PEP) paid a dividend in March even though they just paid one in January. I'm not sure why they do this, presumably they push the dividend for December into January for tax purposes for their shareholders. Or possibly because their fiscal year-end is December 31. Either way, it is just a quirk and I have to keep it in mind when doing my projections. As you can see below, dividends collected this March almost doubled the total from last year. Nice steady month, gaining 1.2%, and as I said in the opening, up nearly 10% year to date. This is nice, I enjoy being up for a third month in a row, but it is making it difficult to find something I'm interested in buying. Still, that's a good problem to have. 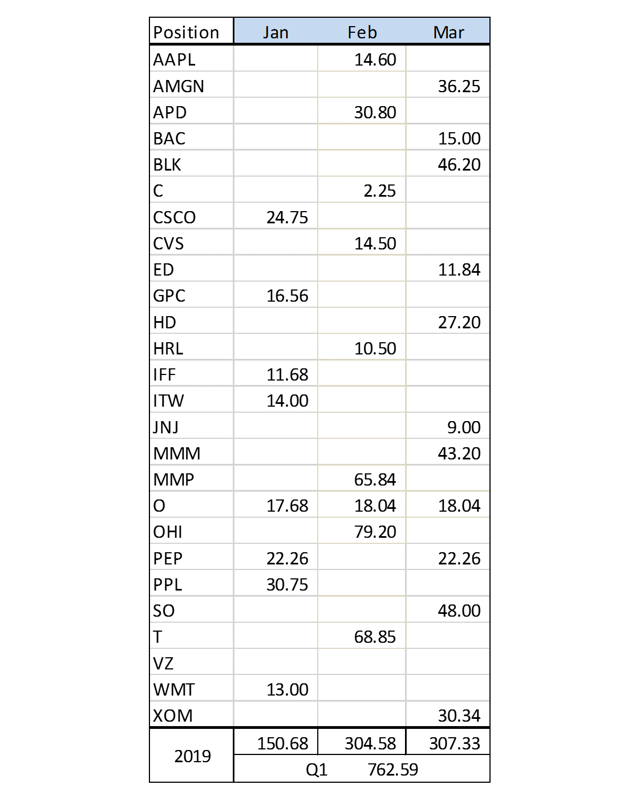 Below are the individual stocks in my portfolio and their prices as of close of business March 31, 2019. The portfolio still has an overall yield of 3.7% despite the run-up in equity prices. 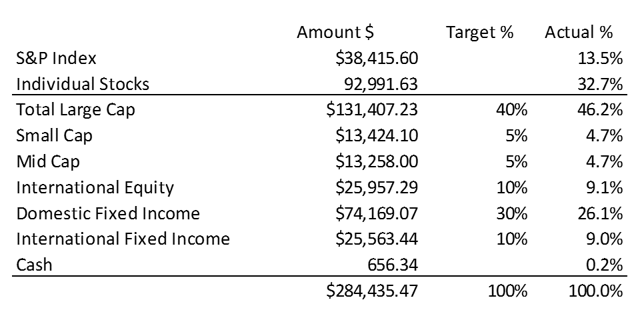 Total expected dividends for 2019 now total $3,194.07. Next quarter should be the first quarter over $800 and it seems like my first thousand plus quarter can't be that far away. My shares of Realty Income Corp. (O) won't stop going up. Not that I'm complaining, but it does make the REIT sector look a little bit bloated. My recent additions of CVS Health Corp. (CVS) are the reason my health care sector is a bit high. Telecom is just a bit too low, but I'll have to wait for the stocks to come back a little bit before I add there. 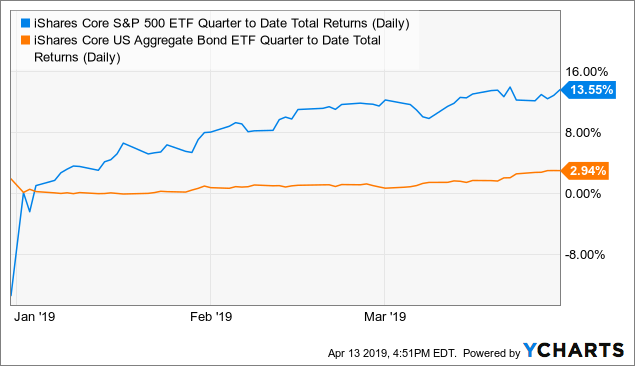 I am adding about $400 per month (basically the fixed income distributions) to my fixed income investments, but I can't keep up with the recent run-up in the equity markets. Since the end of January, my domestic fixed income has gone from about $72,500 to $74,000, a 2.3% gain, while my large cap equity positions have gone from $125,000 to $131,000, a 3.8% gain. Tough to keep the targets in line when one asset class is performing like this. I'll keep adding to my fixed income and may take it up a notch for a few months, but it is killing me to not be buying stocks with this money. Stocks are a lot more fun to buy than bond funds. I had no sales in the month of March. As I had a fair amount of cash at the end of February, I used some more of it to bring my total number of shares of CVS up to 75. On March 6, I bought 25 shares for $54.10 per share. While I didn't catch the low, the stock seems to have found a bit of a floor here in the low $50s. On March 18th, my limit order to purchase Eastman Chemical Co. (EMN) was filled. I purchased 25 shares for $77.13 per share even though my limit order was for $77.75. The stock opened well below the closing price from the previous trading day and I got filled basically as soon as the market opened. I didn't catch the low there either and was real close to adding more shares below $75, but I took a breath and thought better of it. Well, a month after having seven dividend increases in this portfolio, I had none this month. That is something of a bummer. However, with my new shares of EMN and my additional shares of CVS, I added $96.50 to our future retirement income. That breaks the streak of five months adding at least $100 to my future dividends, but not by much. 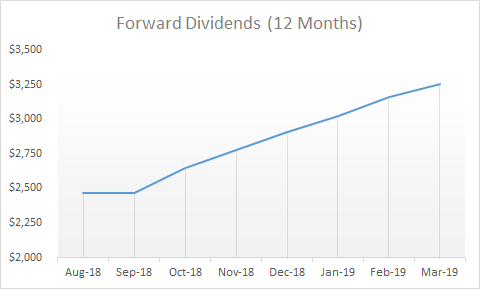 Forward looking dividends for the year April 2019-March 2020 come to $3,255.73. And here's the chart, on which I had to happily adjust the labels on the y-axis because otherwise March would have broken through the top. March continued what has started out to be a great year. The problem with the equity markets being up double digits in 3 months is the "bargains" are getting harder and harder to find. At the end of December, I had a long, long list of stocks I wanted to buy and did not have the cash for. That will happen again. Future dividend income continues to grow, and I do expect a couple of dividend hikes next month. They will only add to whatever positions I purchase in March and maybe I'll lift my future income by $100 or more again. Time will tell. In order to make any significant purchases in April, I will need to sell some of the S&P index fund. I also plan on buying $400+ of a fixed income fund or ETF at some point during April. 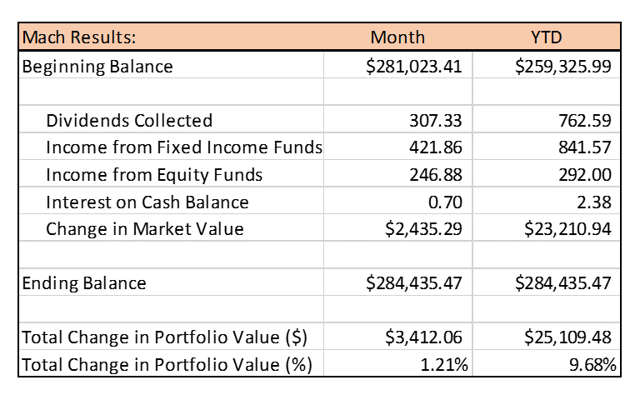 I have started to see the monthly distributions slowly creep up from my fixed income investments, which is kind of fun. Not as fun as when a dividend hike is announced, but fun nonetheless. Looking forward to reporting at least a few dividend increases next month. I hope you enjoyed the update as much as I enjoy tracking all of these things. Best of luck to you and yours as you continue your march towards financial independence. Disclosure: I am/we are long AAPL, AMGN, APD, BAC, BLK, C, CSCO, CVS, ED, EMN, GPC, HD, HRL, IFF, ITW, JNJ, LEG, MMM, MMP, O, OHI, PEP, PPL, SO, T, VZ, WMT, XOM. I wrote this article myself, and it expresses my own opinions. I am not receiving compensation for it (other than from Seeking Alpha). I have no business relationship with any company whose stock is mentioned in this article.